SoulScope™ is built on an ancient spiritual tool called the Enneagram. 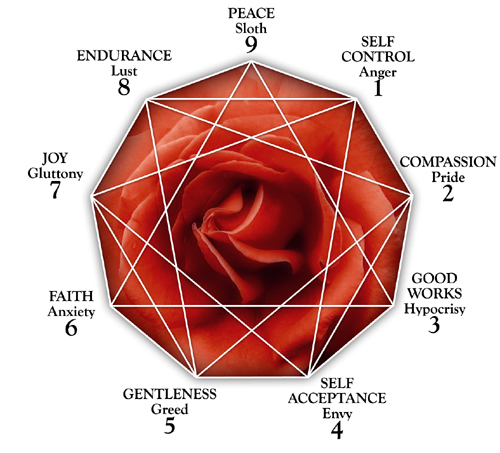 The Enneagram describes nine distinct personalities, with unique motivations, strengths and weaknesses. It is powerful tool for self-discovery and Soul Development. Used internationally, it provides clear, comprehensive understanding about everyday human behavior. Unlike other typologies that tend to "box" people in fixed categories, the Enneagram profiles nine behavioral patterns that are as dynamic and as varied as the individuals they represent. The Enneagram helps each of us develop and engage our unique life transitions. It is a transforming technology. In short, the Enneagram teaches us how to get "the best" from all of us. TheSoulScope™ profile is the only known system that can reliably help you to know yourself as “one-among-nine” types of possibilities out of the entire human population, but absolutely unique, all by yourself. You will come to know that you are a unique creation of divinity, with an unlimited potential to contribute. SoulScope™ provides the most immediate way to access the inportanct of the Enneagram. Developed in concert with LifeWorx, the profiler is available on-line at SoulScope.com. You can take the SoulScope™ profiler now, and begin your Journey!